Solar energy is growing at breakneck speed all over the world, driven by year-to-year slashed prices for photovoltaic (PV) cells. 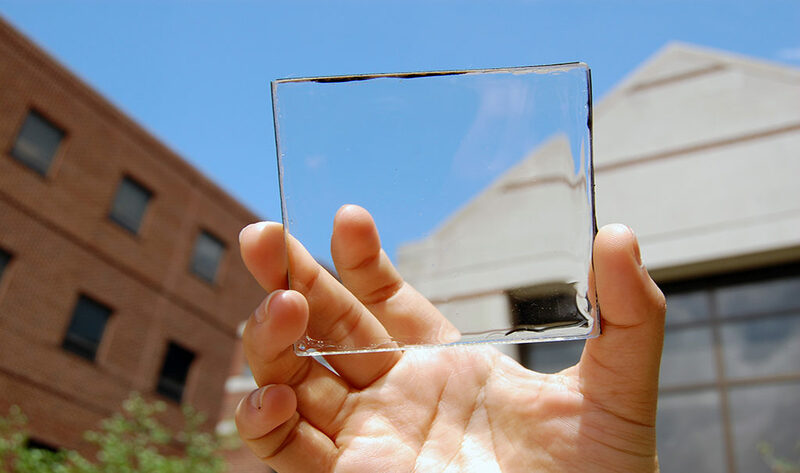 Solar could grow even faster if we were to incorporate transparent solar harvesting devices into windows. One recent study performed at Michigan State University (MSU) found transparent solar cells that convert invisible wavelengths of light could deliver up to 40 percent of the United States’ power. 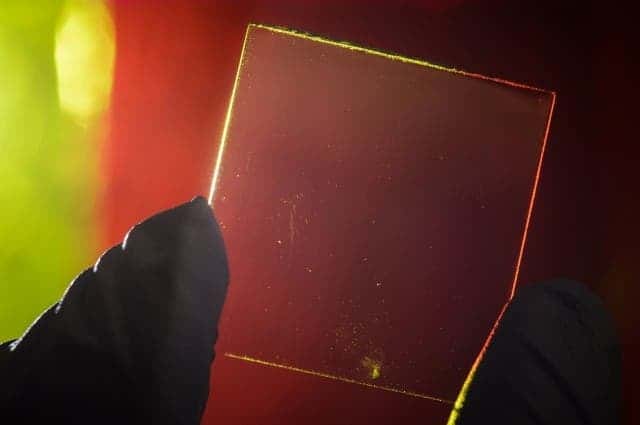 Previously, Lunt and colleagues devised a transparent luminescent solar concentrator comprised of small organic molecules that absorb specific nonvisible wavelengths of sunlight, such as those in the infrared and ultraviolet range. Other efforts developed elsewhere have rendered rather poor results since the solar cells were only semi-transparent, with the material tinted in a colored hue and the cells yielding poor efficiency. The cells made at MSU are totally transparent to our eyes and, when incorporated into windows, do not disrupt the view. Moreover, it’s not only buildings that can employ transparent cells but also car windows, cell phones or other devices with a clear surface. At the moment, only 1.5 percent of the country’s electricity demand is met by solar power. Completely moving away from fossil fuels requires concentrated efforts using a mix of technologies, some established like hydro and wind power, others more innovative like these transparent solar cells. At a first glance, harvesting the solar energy that hits American windows might not seem that much. However, after crunching the numbers, the authors found that there are an estimated 5 billion to 7 billion square meters of glass surface in the United States. If deployed across all of these surfaces, transparent solar cells could supply 40 percent of the country’s electricity demand or about the same potential as rooftop solar, as reported in Nature Energy. Together, the two technologies “could get us close to 100 percent of our demand if we also improve energy storage,” Lund said. Traditional solar panels currently average a rated efficiency in the 18 percent range. The bulk of solar energy lies in the visible range and hence transparent solar cells don’t come anywhere near rooftop solar, sitting in the 1-2 percent efficiency range. Lund says reaching 5% is possible with 7% being the maximum limit. What transparent solar concentrators lack in efficiency, they make up in surface area availability. It’s enough to take a 360 degree look around any busy business center in America to instantly get a feel of this yet untapped potential. What’s more, transparent solar cells can be totally oblivious to bystanders. For all intents and purposes, these are just windows rather than power generators. “Traditional solar applications have been actively researched for over five decades, yet we have only been working on these highly transparent solar cells for about five years. Ultimately, this technology offers a promising route to inexpensive, widespread solar adoption on small and large surfaces that were previously inaccessible,” Lund said.